The top six affiliates in the Twins’ minor league system combined to score a grand total of just nine runs Saturday night. On the bright side, there was still a multi-home run game from Jaylin Davis, a walk-off homer from Mark Contreras and a dominant pitching performance from Andro Cutura. Aaron Slegers began his rehab assignment with Rochester. The Red Wings also added recent waiver claim Johnny Field to the roster and placed LaMonte Wade on the DL with a right hamstring strain. Not a real encouraging first time back out for Slegers, who last pitched on July 10. Kohl Stewart was the innings eater for Rochester, as he went 5 2/3 innings out of the bullpen. Stewart gave up four runs on eight hits and a pair of walks while striking out two. 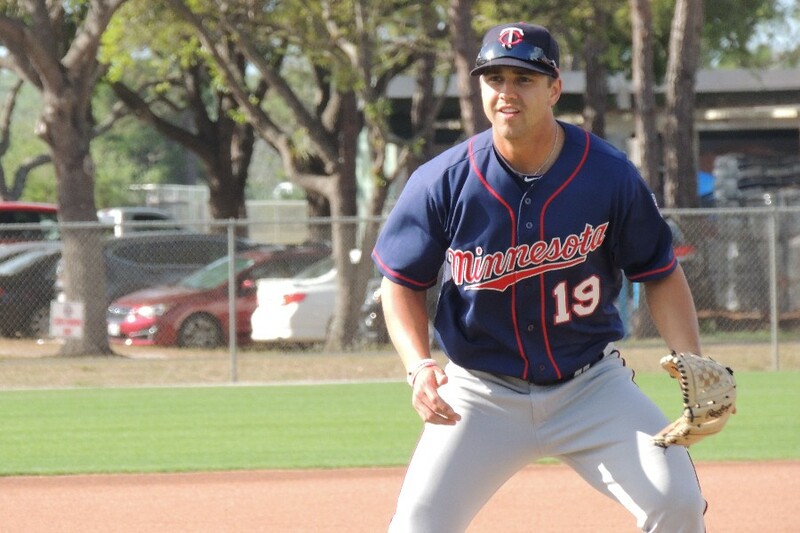 Johnny Field was 1-for-4 with a stolen base in his debut in the Twins’ system. Anthony Marzi started this game and was piggy-backed by Omar Bencomo, who struck out seven batters over 5 1/3 innings. Devin Smeltzer, part of the Brian Dozier trade, made his first appearance in the Twins system. He faced five batters and the Braves recorded a run-scoring single, added another run on an error and a two-run double while Smeltzer was on the mound. All the offense for Chattanooga came from Jaylin Davis. This game was tied 0-0 heading into the bottom of the ninth, but Mark Contreras finished it with a two-out walk-off homer. Let’s call this a Florida State League special. The two teams combined for one run on five hits. Five of Cedar Rapids’ eight hits went for extra bases, but the Kernels could only tally three runs. Jordan Balazovic gave up two home runs, the first time anybody has taken him deep in seven starts. Jared Finkel threw three scoreless innings out of the bullpen and racked up four strikeouts. Huh, well I guess you can have an FSL special in the Appy League too. Much like the Miracle game tonight, this one was tied 0-0 going into the bottom of the ninth. Unfortunately, the Yankees walked off E-Town. After Austin Schulfer started things with four shutout innings, Carlos Suniaga followed suit with four scoreless frames of his own. Luis Gil, who the Twins traded for Jake Cave, struck out seven batters over five two-hit innings. Estamy Urena delivered a two-run double, but that was all the offense the Twins could muster. Only one of the four runs the pitching staff gave up was earned, as the Twins’ defense committed five errors. 17. Lewin Diaz (FM): Out with injury. Ryan Jeffers might be working his way into the top 5-10 prospects for next year. After Rookers rookie MiLB campaign I didn't think we'd see another as good for awhile.. I think Jeffers is 1-upping him. I would love to see him in High A next weekend when I'm at the Miracle games. On a side note, really good to see Jaylin Davis having a silently strong season at AA. What happened to Kirilloff? Why was he scratched? Probably just needed a night off to get some rest. Not a real encouraging first time back out for Slegers, who last pitched on July 10. Call it a hunch (I didn't find any in-depth reporting of the game yet), but the way his night played out, Slegers still ain't right. I won't be surprised if it's his last appearance of the season. Get well, Aaron! I wish we had Luis Gil back. Why the heck is Celestino in E-town? If there is no room for him at Cedar Rapids move him to Fort Myers. Guys like Carrier or Contreras shouldnt block him. Will second the above comments about Jeffers.Doubt that anyone, including the scouts that recommended drafting him, expected a start like this.Can he continue hitting like this? Davis also caught my eye, as a 2 homer night is apt to do.He is another young prospect who has been very good for a couple years while flying a bit under the radar.What may be most interesting is that his production seems to get better as he moves up the ladder. Was this Cutura's best start as a professional, Tom?And a shout out to Austin Schulfer for an excellent start at ETon.Gotta be rooting for anyone from the Stevens Point area of Wisconsin. Carrier's on the DL, to make room for De La Trinidad. I've said before the De La Trinidad profiles a lot like Mark Contreras, in my opinion. Both small, undersized guys and both just have gotten the job done all year. Cedar Rapids outfield includes Akil Baddoo, Gabriel Maciel, Jean Carlos Arias, Jacob Pearson and Trey Cabbage, who has been playing more 1B since the trade. Celestino shouldn't move up to Ft. Myers yet,so now he just keeps playing in E-Town. Granted, he was there last year too and did OK, nothing wrong with a 19-year-old being in the Appy League. Doesn't hurt him at all. Jeffers is off to a fantastic start.Hard to compare him with Rooker at this point since Rooker moved up to Ft. Myers instead of Cedar Rapids, and they are different types of hitters. Also, just naturally a catcher who needs to work on defense should be moved along a little more slowly than a 1B/LF. But it'sgreat to see him off to such a good start. Jaylin Davis has taken a big step forward this year, in my mind. He's slowed the strikeouts and taken more walks. Obviously both of those things are important. He's got 9 homers on the season, but just four in Chattanooga after last night's two-homer night. Now if he can maintain the K rate and bring back the power again, he's another OF with a chance. Cutura just hasn't pitched much since being drafted.He has been hurts o much. He's had a couple of strong startsthis year so far,but this is probably the best. I mean, it's hard to get much better. I was really wrong about Jeffers. He is killing it so far. Arraez seems to be figuring out AA with a 325 avg and 387 OBP with just 2 strikeouts in is last 10 games.To this point in his career he's not a slugger, but their should be a spot for a player who just hits at every level with a high on base percent and minimal strikeouts. Additionally he has committed just 2 errors at second base this year.